It’s already time for the middle of the year reminders! Our morning walk is on Thursday 6th June when we will enjoy our own, beautiful Fernkloof Reserve. We meet in the lower gardens at 08:30. Please bring along a drink and snack to enjoy afterwards. If the weather is bad, please phone me from 07:00 to check whether the walk is on or not. The title of his talk is ‘Extreme bird surveying: a tale of the Fynbos Endemic Birds Survey’. 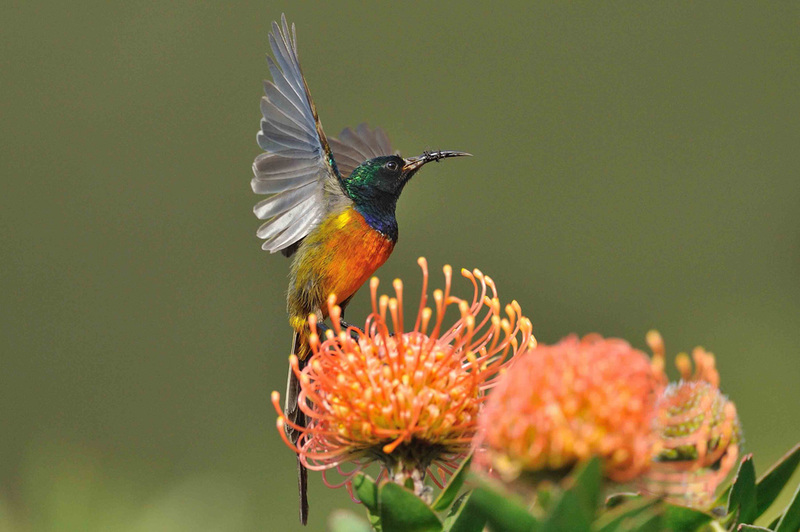 Here’s a snippet to whet your appetites: The Fynbos Biome boasts seven (1/3rd) of South Africa’s endemic birds about which very little is known, including charismatic species like the Cape Rockjumper and Cape Sugarbird, as well as little know species such as the Protea Seedeater and Hottentot Buttonquail. In order to document how many there are, their preferred habitats and movements Alan Lee conducted a 2,500km survey by bicycle that took him from beyond Baviaanskloof in the east, over many mountain passes, from sea level to the highest peaks of the Swartberg, to the northern sections of the Cederberg. Just to make sure, he did it all over again during winter, braving snow and icicles along the way! The talk places an emphasis on the scenic beauty of the Fynbos, with illustrations of a large number of bird species photographed along the way. Please accept Graham and my apologies as we won’t be able to attend this fascinating presentation as we will be in Gauteng celebrating our son’s wedding. Please give Dr Lee a warm HBC welcome! Although that’s all from us for June, I’m sure you all know that it is going to be a busy month in Hermanus with a ‘fynarts’ festival running from the 7th to the 16th. http://www.hermanusfynarts.co.za Although we are not actively participating in the festival this year, there is talk about our involvement next year. You might however notice how well we’ve planned our programme, ‘opening’ the festival with our morning walk in Fernkloof and ‘closing’ it with our presentation on fynbos endemic birds! This bird was seen on 14 May 2013 in the Fernkloof Nature Reserve in Hermanus by Craig Adam. He has already loaded it up to the Birds with Odd Plumage Virtual Museum, where you can see the full details of this record: http://vmus.adu.org.za/?vm=BOP-81. It is a Southern Double-collared Sunbird which has a copper instead of a green irridescence. One of the most remarkable photos in this Virtual Museum! Thanks, Adam, for this fascinating contribution. The Birds with Odd Plumage Virtual Museum is slowly building up a remarkable collection of records of oddities of colouration of feathers and deformities of beaks, legs, etc. Whether it will ever deliver any “science” remains to be seen, but if we can accumulate enough of these records we might start to find some interesting patterns. There are lots and lots of Virtual Museums. Please have a browse around the website at http://vmus.adu.org.za/ — please upload your birds, butterflies, scorpions, … there are “how to do it” instructions on the website. Found this reply by Doug Harebottle on the net: Looks like copper iridescence to me. The basics of iridescence in sunbirds (like in hummingbirds) is caused by structural properties in the feathers and the way that light reacts with/over these microscopic structures. These structures (which comprise layers of air-bubbles on the feather surface) vary in thickness and thus absorb and reflect different wavelengths of light. Basically acts like a prism. This is why we then see different ‘shiny’ colours on the birds. So what we see is actually the result of light refraction from feather structure and not due to pigmentation!. There will be pigment but this will usually be a single darkish colour (brown or black). (This is a basic and hopefully easy to understand version, it gets quite technical when you examine things in more detail and for different species). So perhaps this bird has a different structural layer of ‘air bubbles’ which refracts a ‘copper colour’ and not the usual green? All in all though quite phenomenal.